“Beating a dead horse” conjures up awful images. It should. Yet it often appears as if this is precisely what is happening at this blog site…Islamic whack after whack after whack…with NO end in sight. But it is not as if this frontal assault is due to a lack of subject matter. Far from it. However, it is because of its imminent dangers and the impact on western civilization. Thus, once again, the infiltration/penetration of the Muslim Brotherhood Mafia, is near complete. Almost a sealed deal. Its trajectory is decades in the making, but its lethal impact is exploding under the reign of Barack HUSSEIN Obama. It is not for nothing. His plan for America is their plan – adinakutnicki.com/2012/07/25/the-muslim-mafia-aka-the-brotherhood-their-overarching-plan-what-it-means-for-americas-future-commentary-by-adina-kutnicki/… and his fingerprints can be found within Morsi’s Mafia – adinakutnicki.com/2012/08/13/coming-full-circle-the-planned-empowerment-of-the-muslim-mafia-aka-brotherhood-via-egypt-most-populous-arab-country-under-the-guidance-of-barack-hussein-obama-commentary-by-adina-kutnicki/. Going back to ones roots is everyone’s right and privilege, but not if one is the leader of the free world and intent on implanting said heritage on the American people. Not only that, but one which is diametrically opposed to American ethos – adinakutnicki.com/2012/10/11/the-islamist-in-chief-his-kenyan-wahhabi-relatives-obamas-inner-roots-addendum-to-the-ties-that-bind-the-islamist-in-chief-to-sunni-islam-commentary-by-adina-kutnicki/. A full throttle western disaster. How dare he. His surrogates alike. Yet his first term must be considered child’s play, when compared to the second. Going for broke never sounded scarier. His plans are a national nightmare – adinakutnicki.com/2012/08/02/revealed-the-second-term-plans-of-an-obama-presidency-nothing-short-of-a-national-nightmare-commentary-by-adina-kutnicki/. So where does Brennan fit in? Better yet, where doesn’t he? Let this blog point the way: he intersects with a “mysterious” death during his boss’s first term – adinakutnicki.com/2013/01/13/the-intersection-between-john-brennan-nominated-as-cia-director-a-mysterious-death-during-obamas-first-term-commentary-by-adina-kutnicki/. Thereby, cementing the non-transparent POTUS with a dangerously imbued CIA pick – adinakutnicki.com/2013/01/18/the-patch-quilt-connection-between-obamas-mysteriousnon-transparent-past-his-cia-pick-commentary-by-adina-kutnicki/ . And the main event is yet to come…. 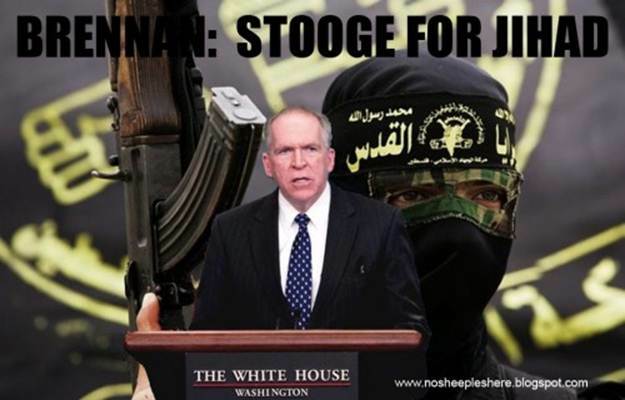 “Did you know that John Brennan, nominee for CIA Director, is a Muslim convert who was turned to Islam by the Muslim Brotherhood? -embedded video! The President’s strategy is absolutely clear about the threat we face. Our enemy is not “terrorism” because terrorism is but a tactic. Our enemy is not “terror” because terror is a state of mind, and as Americans we refuse to live in fear. Nor do we describe our enemy as “jihadists” or “Islamists” because jihad is a holy struggle, a legitimate tenet of Islam. “John Guandolo is not just some guy with an opinion; he’s a guy with sources who have access to the highest levels of government; he’s a guy who has a resume that is beyond impressive; and he’s a guy who claims to know people with firsthand accounts who say they witnessed John Brennan – Barack Obama’s nominee for CIA Director – convert to Islam while in Saudi Arabia. Guandolo was also one of the people who worked on the Team B II Report. Moreover, John Guandolo’s website is a must read – www.understandingthethreat.com/ … beyond on target…bone chilling…even for one duly immersed. Hagel has thus far refused to disclose the foreign funding he has received for his various organizations to the Senate Armed Forces Committee, claiming he has a “fiduciary duty” to keep “confidentiality” of his and his organization’s donors. Hagel’s discretion has led to speculation as to what, exactly, he is unwilling to reveal. Israel-hater to his core, Hagel had this to say – www.algemeiner.com/2013/02/10/hagel-in-2008-video-us-shouldnt-even-think-about-bombing-iran-video/ . Is it any wonder Brennan and Hagel are his picks, and Obama is coming to Israel (for the first time as POTUS), just as PM Netanyahu’s “red line” timeline goes hot? It is impossible – even for a twister and turner – not to connect the Islamic dots. Even more so, “stealth jihad” never appeared more appropriate, nor duly alarming, in describing what is taking place, right inside the highest recesses and reaches of the American tent. WAY past time to start paying attention, and Robert Spencer deserves all due respect, as he is a bell weather source – www.youtube.com/watch?v=6zU2IU8K4lA . Pay/play it forward. Lastly, not being the sort to say, “I told you so”, but I did! This entry was posted in Uncategorized and tagged Adina Kutnicki: Coming Full Circle The Planned Empowerment Of The Brotherhood, Adina Kutnicki: The Islamist-in-Chief & His Kenyan Wahhabi Relatives, Adina Kutnicki:The Muslim Mafia AKA The Brotherhood & Their Overarching Plan For America, Bare Naked Islam:Did You Know That John Brennan Is A Muslim Convert? Algemeiner.com-Hagel In 2008 Video:US Shouldn't Even Think About Bombing Iran by Adina Kutnicki. Bookmark the permalink. Pingback: Watcher’s Council Nominations – State Of Disunion Edition » Virginia Right!